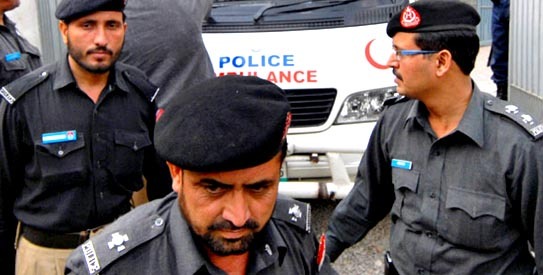 MANSEHRA||2nd October, 2011 : Four policemen were killed and 15 others injured when a bomb blast ripped through their convoy in Torghar district (Khyber Pakhtunkhwa province) on Saturday (on 1st oct) . “The bomb planted on Torghar-Thakot road was detonated by remote control. It hit one of the three vehicles in the convoy. Four policemen were killed and 15 others injured,” Torghar district police officer Fareed Khan told reporters at the DHQ Hospital in Battagram. The policemen appointed on a three-year contract were going to Abbottabad for training. It was the first terrorist attack in Torghar since President Asif Ali Zardari changed its tribal status and made it a district through a notification issued on Jan 27 this year. Soon after the attack, security personnel cordoned off the area and took the injured to a heath facility in Shahgai from where they were shifted to hospitals in Battagram and Abbottabad. The deceased were identified as Naqeebullah, Mohammad Nadeem, Rafeeullah and Fazlur Rehman. “Two vehicles had passed safely. The blast occurred when our vehicle was passing through the area. I don’t know what happened after that,” said Habibullah Ahmad, an injured constable. DPO Fareed said one of the policemen died on the spot, two in the DHQ Hospital and another on way to Ayub Medical Complex in Abbottabad. Eight of the injured were taken to the DHQ Hospital and seven to Ayub Medical Complex. In reply to a question, he said it would be premature to say who was behind the attack. According to the bomb disposal squad, which reached the area four hours after the incident, the bomb was packed with 10-12 kilograms of locally-made explosive.